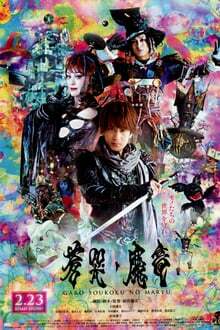 Garo: Soukoku no Maryu (lit. Blue Cries of the Demon Dragon) is the second film to the Garo series. The film serves as an epilogue after Makai Senki and leads up to The One Who Shines in the Darkness. The story continues after the events of Makai Senki. Having made a contract with Gajari, Kouga Saejima honors his end of the deal by traveling to the Promised Land to retrieve a part of Gajari: the Fang of Sorrow. After Kouga defeated Sigma, Gajari transported him to the Promised Land, however, his quest had unexpected results.